Alright fellas, it's that time of the year again; that time of the year you love, but the missus dreads – the release of a brand spanking new Football Manager. That's right, the world's most addicitive game is back for another season of lockerroom tantrums, pitch madness and management mayhem. And with that news, we've rounded up the latest rumours to paint a somewhat bleak picture of what to expect. We're yet to hear when Football Manager 2013 will officially hit shelves, however, taking previous release dates into account it's likely to be released in either October or November this year. Here is the current list of release dates, courtesy of FM-Base. Here at T3 HQ, we have our ears firmly on the ground, so once we hear more, we'll let you know. Alas, there has been no official confirmation regarding when the Football Manager 2013 demo will be released, however, if we go by precedent, it's usually released a few weeks prior to the game's official launch. FM demos usually give players a glimpse of what to expect by allowing them to play a six-month season (in game time). It's not much, especially when there are just a handful of teams to pick from, but there's enough to ensure you make the correct purchasing decision. Football Mananger 2013: Less demanding? There have been a string of key FM 2013 announcements recently, including the announcement of several new game modes. One that sticks out in particular is classic mode, which is designed to be less time-consuming, according to the game's developer. The new classic mode in FM 2013 achieves this by simplifying club management, so it can be completed quicker and there's less of a workload. 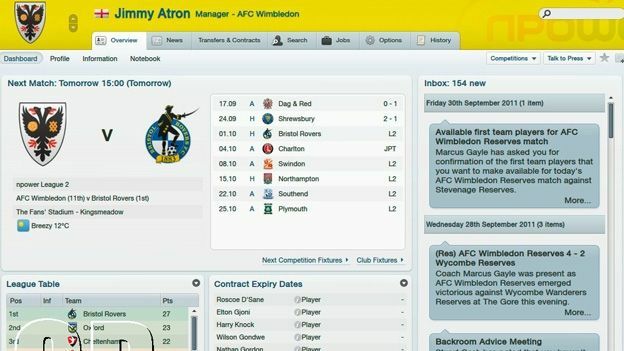 This, the game's creator believes, could help reduce the number of couples citing Football Manager in divorce cases. Since 2004, the game has been citied in more than 35 divorces cases, according to the Telegraph. When asked if FM 2013 will pave the way for a fresh batch of game-induced divorces, creator Miles Jacobson told T3: “Maybe classic mode will put an end to that? It will give people time to play the game, but also to spend some quality time with their partners. Trophy Cabnet: Although it's already possible to view your accomplishments as manager, apparently, lists just don't do it for people these days. According to WhatCulture, FM 2013 should allow virtual managers to display and view their trophies in a, err, virtual trophy cabinet. Saying that, longing after the Champions League trophy you once won with Chelsea, whilst you're fighting a relegation battle with Farnborough probably won't be great for the team - or your own personal morale." Physio Manager: Admittedly the idea of being a physio at a football club isn't the most enticing out there (unless, of course, the prospect of rubbing down hairy, sweaty men's thighs is what gets you up in the morning), but this is not to say a good few Football Manager fans out there are wholly against the idea. In fact, there are many who would like to see how they'd fare being a chairman, coach or scout. Or all three - well, according to TrueFootballManger anyways. Job Interviews: Most people dread going into them, but it seems a certain FM fan is eager for a job interview feature in the next game, according to FootballManagerStory. We're not sure how best this could work - do we fill in a CV and a virtual HR vixen calls us in for a meeting or do potential managers simply have to go into the interview and answer a list of questions correctly to secure the job? Eitherway - we're intrigued. @rocketrobbie76: would like to see a transfer deadline day countdown , similar to fifa12. Would bring drama and excitement !!! Do you have a features wishlist? Let us know which nifty features you'd like to see in the comment section below.